Start the New Year right with mega savings at Eddie Bauer. Enjoy savings of up to 60% off. Make your New Year's resolution to save a warm bundle. Stock up and save up with free shipping of orders of $99 or more with promotion code "GOOSE". 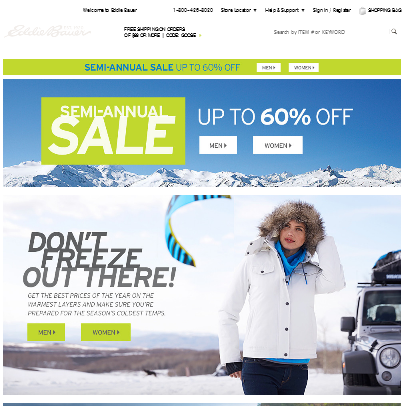 For those deals, more and to check out details and new arrivals visit http://www.eddiebauer.com . Free shipping at The Golf Warehouse with orders of more that $99. Golf gear and details at http://www.tgw.com. Save up to 30% storewide at Zales. Free shipping with purchases of $148 or more. Check out the shiny deals and details at http://www.zales.com. Best wishes for a great 2015 to everyone.